Jamie Boulet sent us another great photo of some of the pirates at the Opening Ceremonies of the St Peter’s Pirate Days September 14-16, 2017. 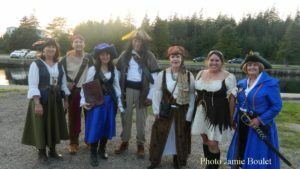 The Pirates Walk at the St Peter’s Canal was one of the exciting events celebrated over the week-end of Pirate Days. Arrr Mateys!